Few people realize that there is a strong connection between water and women, as they descend into the subterranean Adalaj or Bai Harir stepwell and feel the changing dampness and temperature. 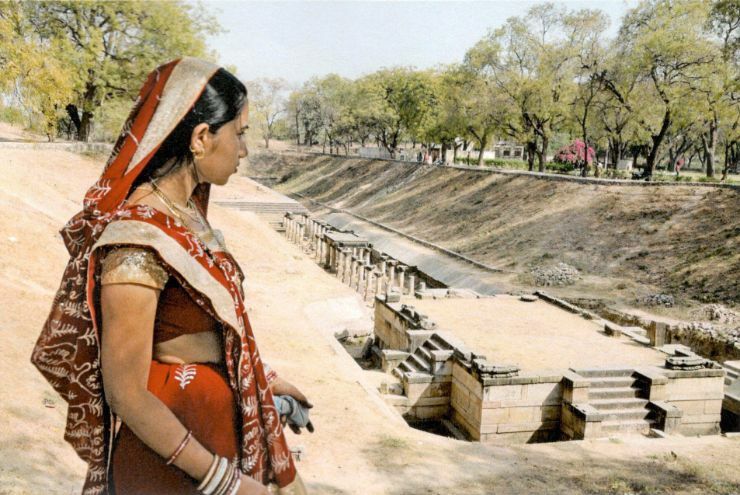 Queens, mothers, daughters, mistresses and goddesses – various women have been patrons or inspirations to at least a quarter of the stepwells built in Gujarat. Historically, this is an important fact that challenges assumptions that women were passive bystanders in the course of India’s history. (The word ‘patron’ itself is male-centric, stemming from the root word ‘pater’, which means ‘father’.) Evidence supports the fact that women were active agents in promoting art and architecture in the public domain, outside of their domestic duties. Purnima Mehta Bhatt, an inter-disciplinarian with grounding in history and anthropology, explains this in her book ‘Her Space, Her Story’. Deeply involved in women’s empowerment, Bhatt resonates in spirit with her grandmother – who was the second woman graduate in Gujarat, a lady who had an enormously inspiring life involving exchanges of letters with even Mahatma Gandhi on the subject of feminism. It is easy to guess why women were interested in giving patronage to stepwells – because they were most often frequented by women from the community to fetch water. The act of patronage was considered pious, as water is the life-giving element, traditionally associated with the feminine. These stepwells became safe abodes where the women could meet on the outskirts of villages, away from the earshot of men or mothers-in-law. To Bhatt, this is exhilarating knowledge because it sends messages to today’s generation that women need to network too – that networking is essential to get emotional support and, in today’s context, to avail of opportunities as much as men do. A panel from the Queen’s stepwell at Patan. From Purnima Mehta Bhatt’s ‘Her Space, Her Story’, taken by Daniel Del Solar. 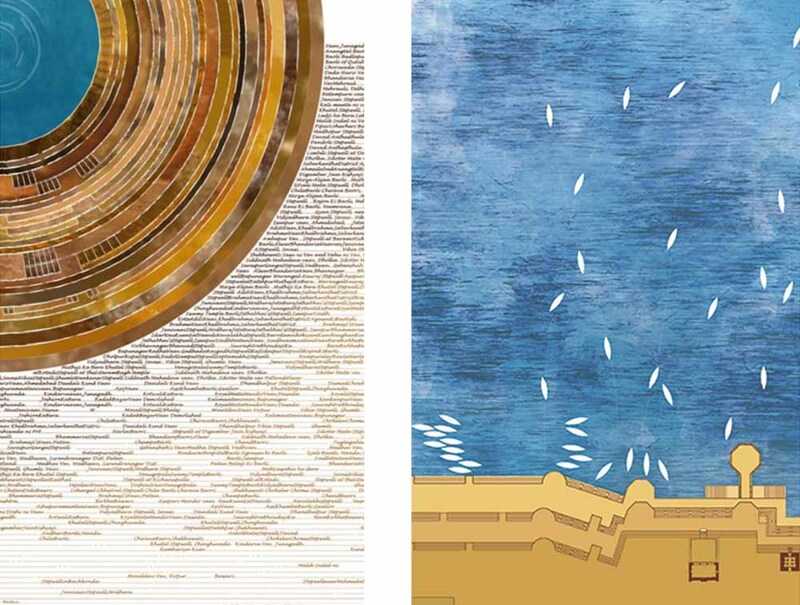 Much of the art, as well as the poetry that revolves around stepwells, is thematically focused on women’s concerns. 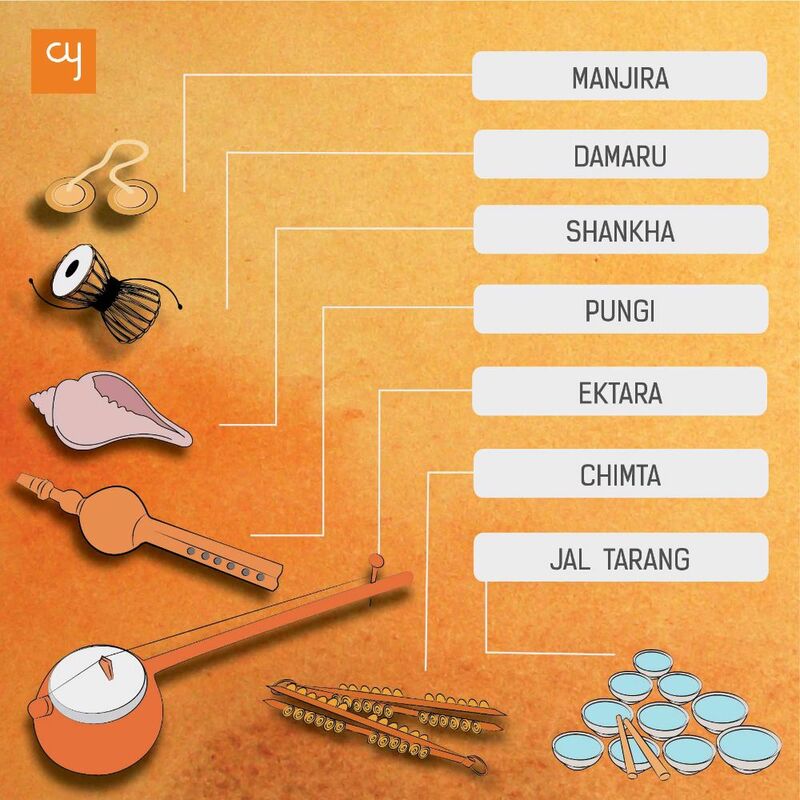 The art forms portray devis like Kali, Durga and Ambika. The Aryan gods that have come to dominate the religious scene today were scarcely portrayed in the imagery of the stepwells. “It’s very exciting that the male gods have been kicked out of the art!” Bhatt laughs. Although a tradition of goddess worship is deeply ingrained in our society, classical Hinduism with its pantheon of male gods – Brahma, Vishnu and Shiva – has usurped the place of the once more prevalent mother goddess who was the earth, the mother and the bearer of life. This pattern of male gods appropriating cultures of goddess worship has occurred in several ancient cultures. Especially where war occurs, the male gods appear on the scene and the females fade into oblivion. 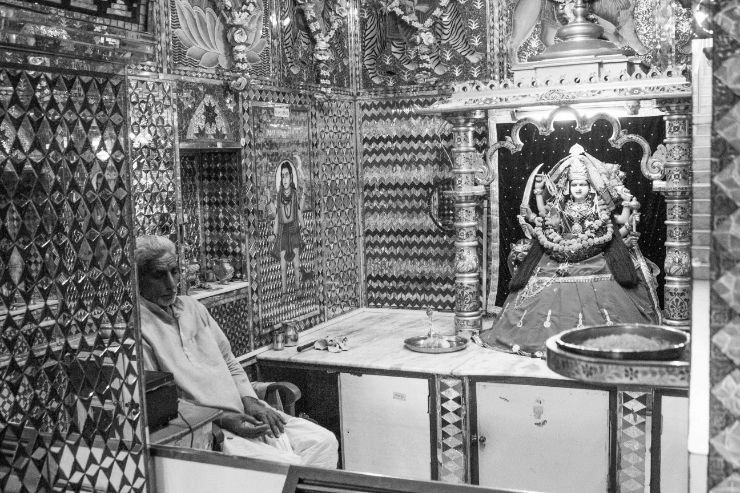 Bhatt points out, for instance, how the worship of the goddess is still very powerful in South Indian cultures, as compared to North India where the culture was influenced by the warrior Aryans. 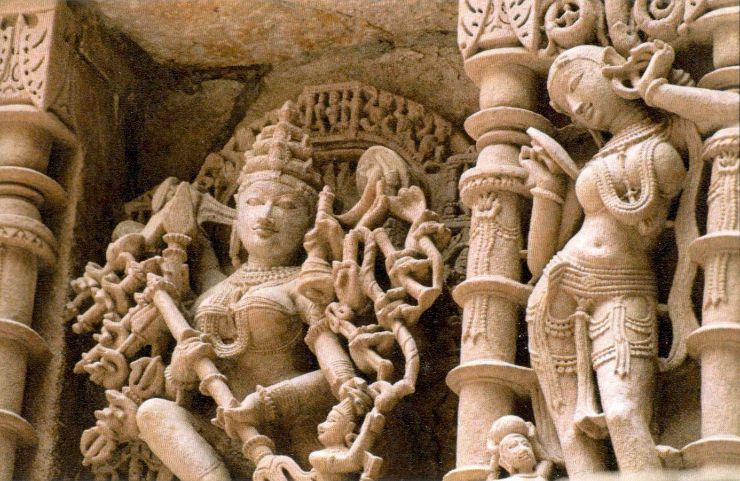 Sculptures at Queen’s stepwell at Patan. 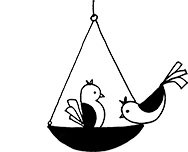 (Left) Maiden with a monkey climbing up her left leg, (Right) Maiden with parrot. From Purnima Mehta Bhatt’s ‘Her Space, Her Story’, taken by Daniel Del Solar. Not only were the stepwells originally built as secular buildings for the purpose of reaching water, the art portrayed in them is largely secular as well. 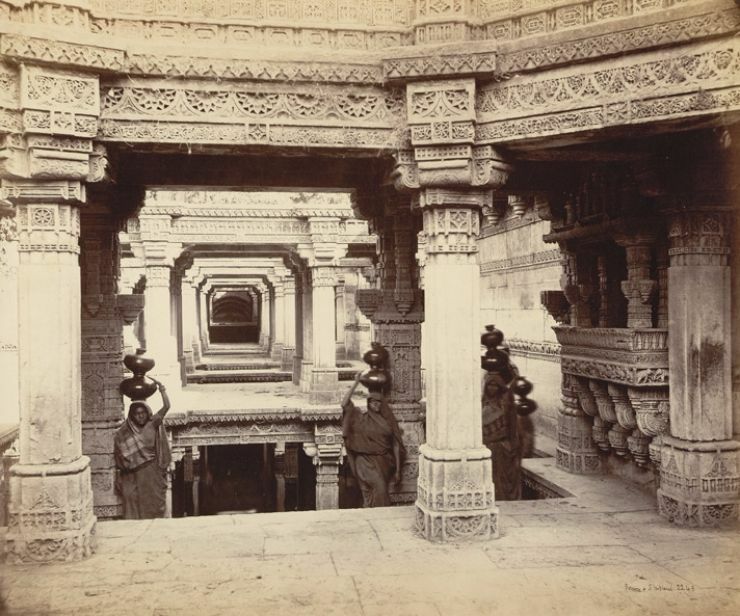 Although goddesses are frequently seen, the stepwells were primarily centered on ordinary scenes from women’s lives. Connection with nature was given importance, through recurring images that show closeness between women and animals. In ancient Indian philosophy, nature or Prakriti was considered the feminine principle – the creative force behind the cosmos. “Particularly at a time like this, when India seems to be struggling with conflicts over religion, I think it is an eye opener for me that stepwells were so secular,” says Bhatt. 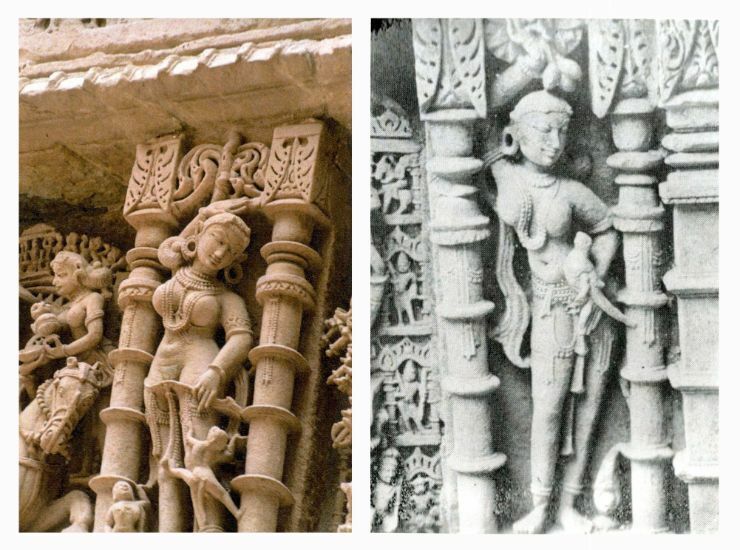 “And it’s interesting that it is the women who seem to have taken the lead in secular art.” Do similar patterns of secular art appear in structures built by women elsewhere? 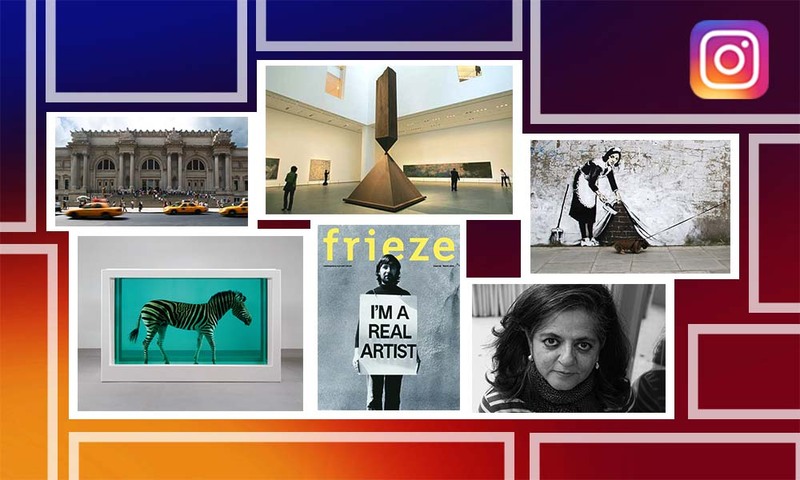 Bhatt expresses her hope that people will study this more closely – perhaps in Egyptian, Roman and Greek cultures. The connection between women, water and wells are of continuing relevance today. With water crisis drawing attention once again to traditional methods of water harvesting, and old wells being rejuvenated, community-based efforts require more urgent attention. During a discussion at the ‘Stepwells of Ahmedabad’ exhibition in the city, Ashoke Chatterjee – who works with the water and sanitation sector in India and has seen women struggle for their right over natural resources –pointed out that if women are not involved and encouraged to be actively engaged in the public domain, then few efforts in this nation will be effective. In an age where historical interpretations have largely overlooked women, inscriptions like those of Queen Rudabai of Adalaj assert themselves strongly, beckoning women across the ages towards agency.